Direct mail marketing is a type of print advertising that is tailored to a particular target audience, selected by demographic and/or geographic aspects. With carefully chosen offers suited to the audience and timely delivery methods, direct mail aims to elicit an immediate response or action on the part of the recipient. Every piece of mail we send is targeted, traceable and measurable. We can assign a unique call tracking number to each campaign to help measure response so that we know exactly how effective each mailing is. We will work with you to develop a program that sends direct mail to the right prospects at the right frequency to keep your practice top-of-mind. Remember, if you’re not mailing them, your competition is! 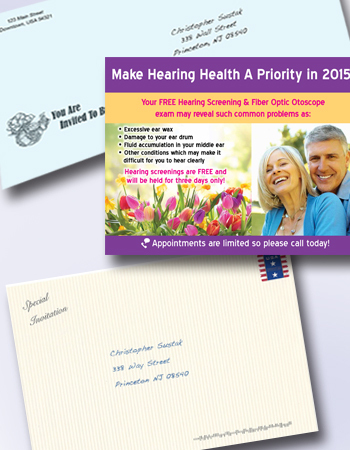 Direct mail that consistently wins the “Mailbox Wars” and answers the consumer’s question of “what’s-in-it-for-me?” will continue to deliver new prospects to the hearing care professional. At SureWay, we work with you to create mail pieces that get opened, read and responded to! For a direct mail formula that deliver responses every time you mail, click here.